Konnie May’s designs grace theater sets, virtual worlds, ArtCars, and most importantly, fashion. She’s founded six companies engaged in this work. Konnie studied theater with a focus in scenic painting at Southern Oregon University. Her painting has been featured at the Oregon Shakespeare Festival, The Intiman, The Seattle Children’s Theater, The Seattle and Berkeley Repertory Theaters, The Rogue Music Theater. Her first clothing company, “Blueberry Trout” featured visually vibrant textiles and wearable art of painted fabrics, made mostly with silks and rayons derived from new plant pulp. ​Konnie’s “ButterMonkey Sweaters” make beautiful use of cast-off and recycled fabrics. She founded “Atomica,” a retail fashion store and DIY hub that celebrated its tenth anniversary, before its closing in 2013. In 2007, Konnie established Jefferson Scenic, gutting and transforming an open warehouse into a viable working studio in Ashland, Oregon. This full-service scenic shop specialized in backdrops, and they also completed set units and props for the Oregon Shakespeare Festival, The Rogue Music Theater, and other independent designers and smaller professional theaters on the east and west coasts. Konnie also founded “Art Now” to fund community art projects and taught at Southern Oregon University. Starting in 2009 she applied her experience on VIE (Virtual Island of Entertainment), a next-gen, fashion forward virtual world for women. In 2009 Konnie relocated to the San Francisco Bay Area and began working for enVie Interactive, creators of VIE (Virtual Island of Entertainment). VIE was a next-gen, fashion forward, elegant and artistic virtual world developed in Silicon Valley. Reporting directly to the company founder, Konnie handled a wide range of duties including market research, HR, vendor relations, logistics and anything else that was required. The demands of a start-up were tremendously varied and it was her job to stay on top of them. She was able to utilize all the education and experience acquired over many years - everything from theater, fashion, and her own entrepreneurial enterprises. She was later promoted to the executive management team and transitioned to other projects managed by the EnVie Senior management team. Her work with this team spanned 7+ years. The most recent project was TAO Wellness, a hand held fitness and wellness monitoring device. She was the go-to person, crafting the company culture as well as processes and procedures for managing teams of artists and software developers. She currently woks as a Project Manager at an Architecture Design-Build firm in Oakland California as she continues to evolve artistically. Her new wearable venture incorporates images reproduced from her original acrylic paintings, she makes into small intense patches, and creatively stitches onto Organic Cotton wearables. ​Konnie May is a technically savvy entrepreneur, problem solver and critical thinker. There aren't many scenarios that she can't manage. Finding concrete solutions to abstract problems is her specialty. 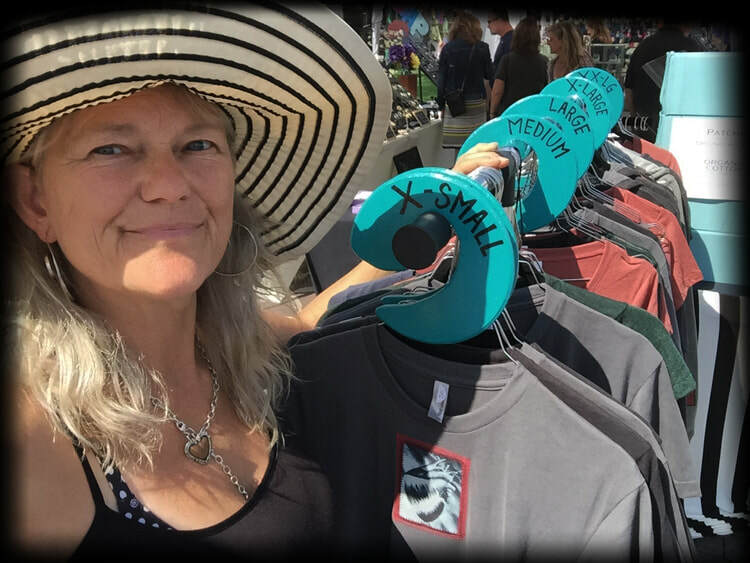 ​Throughout years of employment, self employment, starting, managing and running businesses, Konnie's personal painting, clothing lines and creativity have thrived. Her upcycled wearable line continues her pattern of green couture with a decidedly DIY aesthetic. Utilizing recycled materials to create fashion and design.